As some of you know, we participate in a microlending program through Kiva, an organization that helps set up microloans between ordinary folks like us and small business owners in developing nations, lifting those business owners out of poverty, helping their economy, and generally making the world a better place. Our loan to Vladimir Tanasenko in Ukraine was just repaid (congrats, Mr. Tanasenko!). We now have the option of doing several things with our money, including withdrawing our cash, donating it to Kiva for operating expenses, or re-loaning it to another business owner. 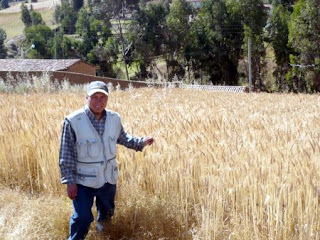 We’re re-loaning the money, this time to Nilton, a farmer in Peru. [We have a special connection with Peru since it’s where Brigette’s sister-in-law is from.] According to Kiva, Nilton is a young entrepreneur who, day after day, works on an agricultural project near his home. After three years of academic preparation, he now applies his knowledge to the agricultural project as well as to his own cultivated land. He wishes to support his communal land with an agricultural consultant’s office where he can work daily to achieve success. He yearns to improve their harvests with his technical knowledge. Good luck with your business, Nilton! You guys are amazing! I love that you give your hearts to what you believe in.